Indian Food is as varied as the country itself, with every region having its own specialties. It therefore, does not always have to be 'Hot' nor can any one dish be labeled a 'Curry'. (That said, many Indian cuisines can be pungent to those unaccustomed to it. Even if you have eaten at Indian restaurants outside India, remember that many such establishments tone down the spice quotient for Local tastes). Most of dishes with gravy are normally called Curries but are prepared with a different masala (a combination of spices and seasonings) containing among other things coriander, cumin, garlic, turmeric, chilies, cardamom, nutmeg, black pepper, cloves cinnamon, bayleaves, saffron, mace and nutmeg; all the aromas ad flavors that brought traders to India for centuries. A traditional meal in large parts of India is usually served in large metal plate called a "Thali" (when you see the word in a menu, usually prefixed with a region name, it means you're getting a full traditional meal from that region) with a number of small bowls used to hold the gravy dishes. The meal is normally accompanied with unleavened bread, usually wheat-based, in the North, or rice in the South. North India food has been has been strongly influenced by Mughal cuisine and is broadly non-veneration characterized by the use of yoghurt, fried onions, nuts & saffron. Outstanding dishes worth trying would be biryani, gushtaba, tandoori dishes & kababs. Beef is rarely eaten in the North since many Hindus consider the cow sacred. Pork, forbidden by Islam, is a rarity in areas with a substantial Muslim population. Southern India is renowned for its spicy curries, rasam (millagu tannir or literally pepper water, before it was anglicized to mulligatawny), masala dosa or crisp potato pancakes and a variety of rice-based dishes. The hot food has to be tempered with pappadums, yoghurt and buttermilk. Coconut tends to be extensively used. Places well known for their non-vegetarian cuisine are the Chettinad area in Tamil Nadu, and large parts of Kerala. And of course the coastal areas get you some very good fish. East Indian specialties include freshwater fish cooked in a variety of sauces, sweetmeats made from cream and cheeses are also a specialty around West Bengal. The areas further North-East are influenced by Tibetan cuisine, with 'Momos' (delicious chicken or pork dumplings) being a popular dish. Western India is a very diverse area in terms of cuisine. 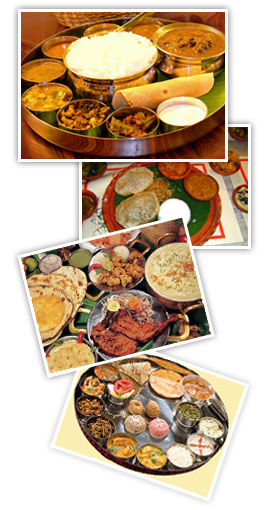 Gujarat with its strong Jain traditions is almost entirely vegetarian with a sweetish touch to all its dishes. Goa is famed for its Portuguese-influenced meat and seafood dishes. Maharashtra's coastal regions also have their traditional seafood cuisine.